Recently, Ellen DeGeneres gave a $10,000 gift to a waitress who treated two National Guard soldiers to their lunch. This act was yet another example of Ellen's generosity, standing alongside the dozens of causes to which she lends her name. Speaking of which, psychological researchers might find a clue to her generosity in her name. In what has become well-known research, Pelham, Mirenberg and Jones describe a phenomenon called implicit egotism. Studies show that a disproportionate number of people choose careers with labels that bear a resemblance to their own names. That means that people named Dennis or Denise are overrepresented in dentistry, for example. The researchers suggest that people's positive associations to themselves draw them to careers or other things that relate to self. And if that is so, Grace might be more gracious, DeGeneres will be more generous and Joy...you get the picture. If nothing else, we learn from this research that names are important. Best not to call your son, "Brute." But the question remains: is that tendency to identify with our names merely a sign of egotism? Judaism would argue against that idea. We read in Samuel (1, 25:25) "Like his name, so is he." That tradition teaches that names represent the essence of the individual. Could that be the case? If so, maybe people are compelled to pursue a career or other associations that relate to their names as a way to honour something that is essentially true about themselves. In other words, maybe doing so is part of their calling. We can't know. But we can know that names matter. It shouldn't be surprising, then, that some contemporary psychotherapists take an interest in the names of their clients. One psychiatrist, Isaac Steven Herschkopf, spoke of this in a Letter to the Editor published in Psychology Today (July/August 2004). He reported that he routinely asks his patients the origins of their names. He wrote, "their answers can be as revealing as the mother whose rebellious teen had been named after his despised absentee father, or as poignant as the uncoordinated son named after his famed athletic superstar father." He added, "our names are as revealing as they are unique." Names are laden with meaning and message; I will suggest that signatures are equally rich. Were therapists to take note of their clients' signatures on intake forms, they might learn a thing or two. If Carrie Fisher was the client, the therapist would notice something unstable about that signature, as if the personal self ("Carrie") sits precariously atop the legacy of Fisher, her professional name and that of her father. We can easily imagine that top name slipping off and falling on its side. Another sign of vulnerability: note how she carefully lassos her first name -- representing the personal self -- shut, as if in an effort to create security for herself, and tucks that name under the protective canopy of the F in Fisher. What about the signature of Chris Rock? Note how this writer defies the imperative to write legibly and shapes letters in a way that could only be described as odd, a flagrant sign of rebellion. Note what we could call a glyph or symbol in his first name, a graphic image of male genitalia, attesting not only to somebody who is crude, but showing the degree to which that behaviour is central to his identity. In fact, Rock forms that symbol with the first strokes of his pen, showing that his first go, his opener when he walks in the room, is something akin to potty talk. And how sad to find this mentality at play, given his first name, Chris, a name rife with religious overtones. 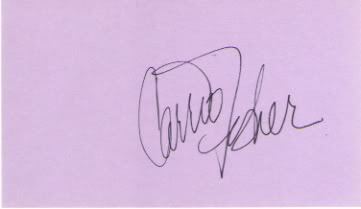 What do we see in Ellen's signature? Can you read it? That illegibility implies a degree of hiding, a fear of "coming out." The therapist would suspect that for all she reveals, something core remains hidden. The signature is also back slanted, leaning to the left, a sign of reserve. Interesting. Then you have a line that flies enthusiastically to the right, divesting energy towards the direction that represents the world of others. Graphologists understand that galloping right-tending stroke to denote generosity, a character trait that, so pronounced in this signature, is clearly central to her identity...as is (interestingly) privacy. So this sample tells the story of a writer who is both elusive and magnanimous, an interesting and complex paradox. People are, after all, complicated. Names are important. And signatures turn those names into graphic icons. Next time a form directs you to "sign here," take heed. That phrase provides instruction, but also advice. There is a sign here, a personal brand, a message, a letter waiting to be read. Look around these days and virtually every garment sports a logo, but no mind that. The one close to your heart is the one on the page, not the one on your sleeve. This column introduces the clinical application of the psychology of handwriting, a European technique mostly unfamiliar in North America. Readers can bear in mind that graphology is appropriately used alongside other assessment methods, never used in isolation. This method is discussed fully in Clinical Graphology: An Interpretive Manual for Mental Health Practitioners, recently published by Charles C. Thomas Publishers.